We are slowly traveling our way across Banff and Jasper in winter, one wilderness hostel at a time. We love hosteling because it gives families an affordable way to stay and play in the mountains year round without having to camp (something I enjoy in summer but don't really relish doing in winter.) We still feel like we've gone camping and my son refers to the hostels as "camping cabins" which is a fairly accurate description given the rustic nature of many wilderness hostels and their location set back in the woods away from the highway. One wilderness hostel that I've always enjoyed as an adult is the HI Castle Mountain Hostel. 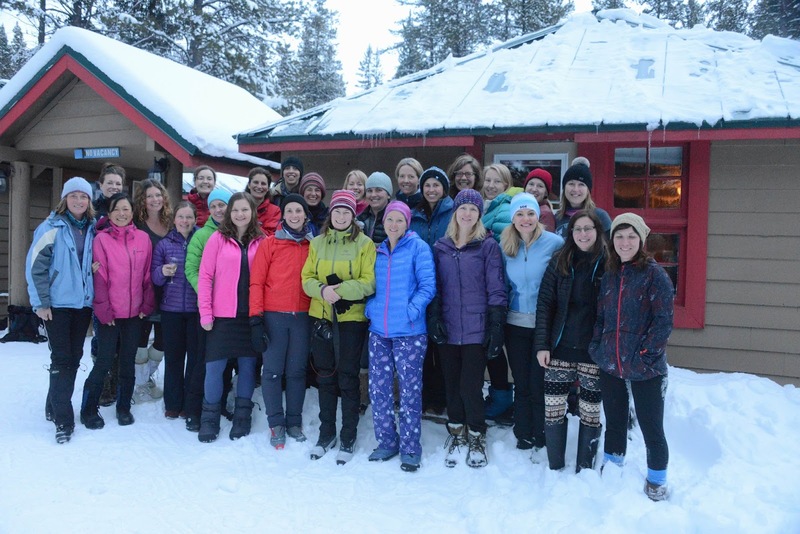 I rented the entire hostel last winter for a girls' trip with 28 ladies and we had a fabulous weekend skiing, eating, and hanging out in the comfortable hostel. It got me thinking that it would be a great location for a family trip too despite the lack of private rooms that some hostels have. Families who don't want to share the dorm rooms with strangers can always rent out the whole hostel for an affordable group weekend. Five families would be able to share the space nicely and there is plenty of living space to never feel crowded. Note that families with children under the age of 6 will have to book the full hostel because kids must be 6+ years old to share a dorm room. Apart from the dorms, the hostel features a large fireside room with plenty of space to sit, play games, drink a cup of tea, and chat with fellow guests. There is also a spacious kitchen, fully stocked with all dishes and cooking supplies, with two long tables for eating at. Overall, the HI Castle Mountain Hostel is a very comfortable place to spend the night with indoor plumbing (something rare in a wilderness hostel,) electricity, and showers. There is even cell coverage at the hostel! Linen, blankets, and towels are included with your booking so you don't have to pack a lot for your stay. Located a short 10 minute drive away, this is the top hike in the Castle Mountain area. This is a premier winter hike in Banff National Park and visitors can hike to two large waterfalls, crawl through a cave to view the first set of falls, and hike down into the canyon to discover other hidden waterfalls and ice caves. For more information on this hike, please read my previous story: Ice Caves and Frozen Waterfalls in Banff National Park. From the Castle Mountain Lookout parking lot the trail got a lot harder, which is interesting because we were now on the "easy" part of the trail according to Parks Canada. I think they have their trails confused because we were definitely on an intermediate trail now and it was no longer beginner friendly. The kids struggled but did awesome on the rolling terrain, steep hills, and tight trail through the trees near the end. We skied out of the trees right at Castle Junction, steps away from our hostel. It was a great one-way ski trip (despite the challenging second half of the trail) and we sent the dads back for the vehicle so that the kids got to do the whole trail in the downhill direction. There is no shortage of things to do at Lake Louise, located a short 20 minute drive away. Skate on the lake, ski across the lake, ski the Moraine Lake Road or the Great Divide Trail, Ski the Tramline Trail downhill with a car shuttle (our favourite trail with kids,) go snowshoeing in the area, or spend the day at the Lake Louise ski resort. There is something for everybody here. In the opposite direction from Castle Mountain is the Town of Banff, also located a short 20 minute drive away. The Castle Mountain Hostel is right in the middle of everything! 20 minutes to Banff and 20 minutes to Louise! How could you be more ideally situated?! Alternately, there are many other cross country ski trails, skating rinks, hiking trails, and there are two ski resorts for downhill skiing. There is no shortage of activities for every interest. Also, if you time your visit right, you can check out the Snow Days activities happening between January 15th and February 7th. There's even an ice slide downtown for the kids. For more information on Banff in winter, visit the Banff Lake Louise Tourism website. My son has not skied this trail yet and we personally find it too much fun on skis to ever consider hiking it, but it is a very popular trail with snowshoers. And while our son hasn't skied the trail on his own skis yet, he's been to the lake in winter before in a ski pulk. It was a challenging ski pulling a sled but it's doable for strong skiers. The scenery makes this trip a "must do" outing in the area for experienced cross country skiers, families who can tackle a 10 km hike, or for adults venturing out solo. We are hoping that our son Noah will be skiing this trail as his first ski touring trip next year. (This year if we get ambitious.) If you are going to try to do this trail with kids on skis, know that trail does gain 200 metres so when we do it, we'll be pulling our son up with a tow rope and my husband will likely use climbing skins while towing. For a great trail description visit the Hike Bike Travel website where Leigh has written about her experience skiing this trail. Who's booking a weekend at Castle Mountain now? To reserve beds at the HI Castle Mountain Hostel please visit Hostelling International's Website. Please know that children must be 6 years old to share a dorm room at this hostel. If you have younger children, consider booking the full hostel with a group of friends. Information on booking a hostel can be found here. I had no idea about the Castle Mountain ski trails so will try and check out it out this winter. The "great room' at the hostel looks pretty darned nice. A super way to get out in winter with your family. Thanks for linking to me. I love the Boom Lake trail - also nearby Chickadee Valley in BC though it would be harder with kids.